Following the unexpected box office success of Star Wars in 1977, movies featuring aliens became all the rage. 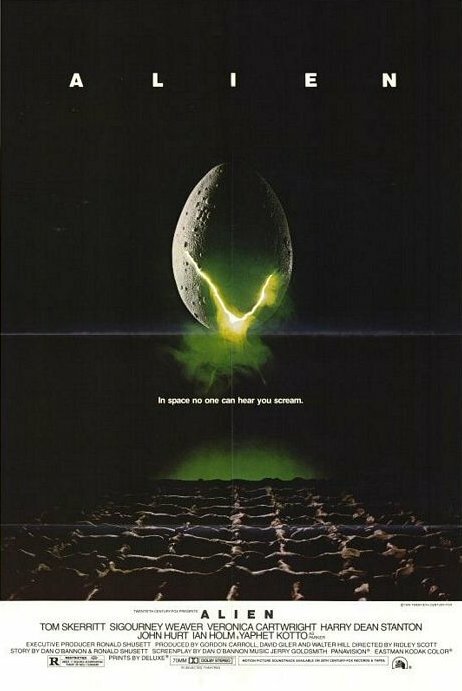 That trend brought us movies like Star Trek: The Motion Picture and Close Encounters of the Third Kind, but the idea of peaceful extraterrestrial life wasn't what Ridley Scott was aiming for when he helmed Alien in 1979. While most of the science fiction movies released in the wake of Star Wars featured a mixture of aliens that were both good and bad, Alien featured nothing but evil. There's no Wookies or Vulcans in sight, only a gigantic monster whose sole purpose is to kill, maim, and lay waste to everything around it. While Alien may have a nice glossy coating of science fiction on the exterior, inside is nothing short of a horror movie. It wasn't the first movie to have a seemingly unstoppable monster picking off each member of the cast one by one, but it has earned a reputation as being one of the best in the thirty years since it was first released. Our tale of terror begins in the year 2122 aboard the Nostromo, a commercial towing vessel hauling an enormous ore refinery and twenty million tons of mineral ore behind it on its return course to Earth. Their journey home, however, is interrupted when the ship's computer intercepts what appears to be a foreign distress beacon originating from a tiny, uninhabitable planet named "LV-426." The computer awakens the seven-person crew from suspended animation to investigate the transmission. Captain Dallas (Tom Skerritt), navigator Lambert (Veronica Cartwright), and executive officer Kane (John Hurt) venture to the surface of LV-426, quickly discovering the remnants of a derelict spacecraft hiding thousands of bizarre eggs within it. Unfortunately for them (but fortunately for us, the viewer), the crew of the Nostromo made a very bad decision in examining the eggs. One of the eggs opens and a giant parasitic creature leaps out, cracking through Kane's protective helmet and latching itself onto his face. Dallas and Lambert carry their unconscious crewmate back to the ship, where warrant officer Ripley (Sigourney Weaver) refuses to let them in due to quarantine regulations. However, science officer Ash (Ian Holm) turns a deaf ear to Ripley's protests and opens a hatch to let them in. Kane is taken to the Nostromo's medical ward, where Ash deduces that removing the thing from his face poses too great a threat, especially since it's forced a proboscis down his throat. But eventually, the thing ends up falling off on its own, seemingly dead. Kane wakes back up, and everything is hunky-dory. He's better! The movie's over, let's go home! Oh wait, it hasn't ended yet, after all. Oops. Anyway, the seven crewmembers sit down for a meal, but the normal dinnertime chitchat is interrupted when Kane begins gagging. His choking develops into a full-blown seizure, but before anyone can help him a lizard-like creature bores its way through his chests and scurries away, leaving Kane's bloody corpse lying on the dinner table. The remaining crew begins a search for it through the Nostromo's dark, narrow corridors, but soon find themselves at the mercy of a beast growing larger and more terrifying with each victim. While I'm probably more partial to its 1986 sequel Aliens, I still loved Alien. As I said above, it isn't the first movie to feature an monstrous killer (in space or on land) nor is it the first sci-fi thriller, but it manages to seamlessly blend the genres into a "haunted house in space" that is quite scary once it gets rolling. Truth be told, Alien has more in common with Halloween than with the other zillion sci-fi movies released in the late '70s and early '80s. The movie even has the stereotypical "cat jumps out and scares the crap out of someone" horror movie moment. Alien even features a spin on the "Final Girl" idea, with Sigourney Weaver as a strong heroine. Most people were expecting Tom Skerritt to be the last person standing because not only did he have top billing, but because he was a man. Despite only being Ridley Scott's second feature film (the first being The Duellists in 1977), his genius as a director is evident. Alien rooted Scott as a true visionary, and even after seeing its premiere twenty-five years ago, both Alien and his 1982 effort Blade Runner are ultimately mentioned by reviewers whenever Scott makes a new movie. Admittedly, the movie moves awfully slow for the first hour or so, but any conception that it's boring is quickly dashed by the shock and awe of the Alien's wrath. The slow, almost lethargic pace at the beginning is just the calm before the storm. Once we get to the dinner scene, everything starts going to Hell in a big way. Scott's direction is flawless here, and his talent can be seen in numerous moments throughout the movie. Take, for example, a scene in which the character Brett (played by Harry Dean Stanton) is hunting for the crew's pet cat. Making stellar use of an uneasy environment, Scott makes sure the audience is as freaked out as possible. When the alien attacks, we cut away to see the cat watching a horror we can only hear. He shows just enough to send the viewer's imagination into overdrive, and the imagination is always much more terrifying that we could be shown. Scott's use of frantic handheld camera movement is unsettling, not letting us really know what's happening and putting us into the universe of the characters we're watching. His work is complimented by Jerry Goldsmith's musical score, which wonderfully captures the tension and the mystery of the movie. His use of a subtle heartbeat thumping during the slower, more atmospheric scenes is incredibly effective, and effectiveness goes a long way in movies like this. Goldsmith won a Grammy and a Golden Globe for his score, so it can't be all bad, can it? Most movies live and die by the quality of their cast, and Alien has a cast that's up to task. The cast is comprised of actors who were relatively unknown at the time (though a number of them would go on to greater fame in the future), and while we don't really get to know their characters that well, the seven do have a very engaging chemistry. We can believe each of them are normal, frightened people, and perhaps the most realistic is Veronica Cartwright. Her character represents what how most of us would act if we were confronted with an extraterrestrial hellspawn that intends to kill us and use our bodies to propagate its species. Cartwright's Lambert is a hysterical, blubbering wuss that's scared to the point of emotional exhaustion, and though some may find her annoying, her character is us. Each member of the cast is entertaining in their own right, but I would be remiss if I didn't mention Sigourney Weaver as Ellen Ripley. Weaver would go on to greater success with movies like Ghostbusters, Gorillas In The Mist, and Aliens, but the original Alien film is her breakout role and she shines. A lesser actress wouldn't have the strength Weaver conveys, and it is her performance that makes her character such a lasting icon in sci-fi. Even today, in the rare occasion where we have a female hero in an action movie, she commonly finds herself being weighed against Ripley. While she essentially is the typical Final Girl here and didn't truly cement her reputation until the release of Aliens seven years later, Ripley is in rare company with Linda Hamilton's Sarah Connor from The Terminator as the patron saints of heroines in action movies. However, Alien's true stars not the seven human actors, but the production design of Michael Seymour and the Oscar-winning creature design of H.R. Giger. Seymour's work is an absolutely perfect parallel for what the movie is depicting, and Seymour presents us with a maze of dark, tight passages that amp up the claustrophobia and tension. Assisting this is Giger has crafted one of the ugliest, most horrific sci-fi villains ever. From its mouth of razor-sharp teeth to the slimy reptilian body, few movie monsters can equal the fright the Alien instigates. While the look of the Alien would improve in the sequels thanks to advancements in special effects, Giger's design is still frightening. His work serves as a reminder that before filmmakers resorted to CGI, monsters could be just as scary using practical effects. Quick thought about the movie: Did anybody else notice the Purina logo in certain places? Are we to assume that 100 years from now, a dog food company can specialize in interstellar travel? With all the recent advances in technology, I don't doubt it. But that does make me wonder if Purina would have any ties with the malfeasant Weyland-Yutani corporation depicted in the Alien franchise. Despite twenty-five years having passed since it was first released, Alien has withstood the test of time as one of the true classics of both horror and science fiction. One could even argue that Alien was as influential as Star Wars, demonstrating that you don't have to set your movie a long, long time ago in a galaxy far, far away to make a good sci-fi movie. It may have not been the first movie of its kind, but it is without a doubt one of the best. Alien gets four stars and a hearty recommendation, so go check it out already.